hey guys, I dunno where else to ask, and since the gigabyte experts who helped me overclock a few PC's are here, ill give it a shot. if its ok ill post the link to the thread where everything is written, let me know If its not, ill just repost all the info here. Last edited by GanjaStar; 11-22-2011 at 12:18 PM. No need to copy the linked-to thread here. We need details about your system. Follow steps #1 - #4 in http://forums.tweaktown.com/gigabyte...tml#post295784, post #5. Copy the P35 bios template into NotePad or any plain text editor, fill in your current bios settings and post your bios settings. Ignore the remainder of the post. Generate a CPU-Z text report and upload the Report.txt file in your next post. Click on About and then click Save Report.txt. EasyTune6 does not work with P31/P35 systems. Last edited by GanjaStar; 11-22-2011 at 02:50 AM. Your CPU default voltage is 1.35v why are you setting it below for overclock? Try 1.35 or more. What kind of CPU cooler do you use? Last edited by GanjaStar; 11-22-2011 at 06:28 AM. 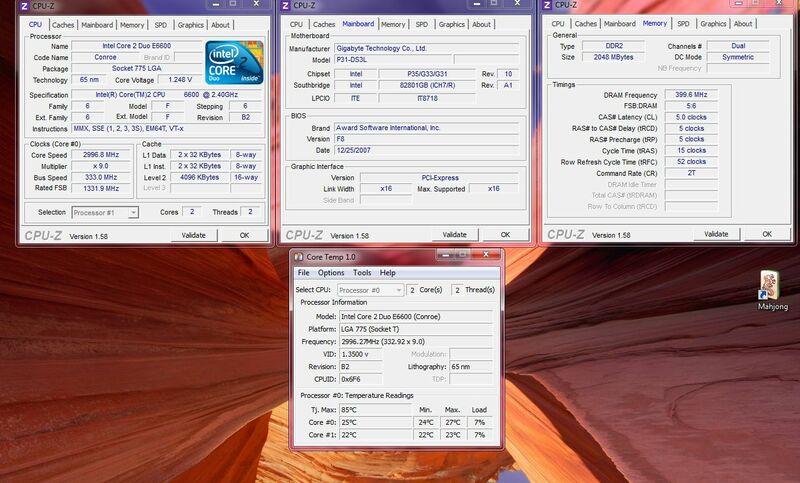 Does that application recognizes that you have 4 cores? its a dual core, and yes, all apps recognize the two cores. Its a strange issue that i've never encountered. a corecctly recognized CPU performing sub par. IInteresting, are you using an add-on graphics card or the built-in graphics? 8800gtx, theres no built in gpu on this mobo. Oops I was confusing with another thread.